My story really starts when I was a child. In my Aunt's top drawer of her sideboard was a medal, when I picked it up to look at it my Aunt would always make me put it back straight away. When I asked her about it all she told me was it was her father's. I remember asking my Aunt about her father. She replied that he was a sergeant in the Army. (This confused me, I was about six, and my Mother had always told me that her father had been in the Navy). I asked if she was sure and she repeated again that he had been a sergeant in the Army. At the time, I put it down to the fact that she was old and confused, (at that age everyone seems ancient). I was vaguely aware that there had been a war but it was so long ago that no one could possibly remember it and even my aunt couldn't be that old. As I grew older, I became interested in History, and through conversations with my Father learned that his father, my Grandfather, had served in the First World War. My father could only tell me a couple of stories, (my grandfather had died in the late 60s), as his father would not talk about it. The stories my father told me were very brief and not very specific. I decided to try and research my grandfather's army career with a view to going on a trip to visit the battlefields where he had served, with my father. Unfortunately, before we were able to arrange this my father died. My research had told me very little, I knew my Grandfather had been with the 7th Battalion the Suffolk Regiment, and had entered the Line at "Plug Street". After that he had been wounded on at least two (possibly three) occasions, the most serious of which required a silver plate to be inserted in his head. So based on this I booked myself on a "Battlefield Tour" for March 2001. This was a big mistake, a "Battlefield Tour" actually turned out to be a trip to several cemeteries, with a guide who tended to force his own opinions on you rather than telling you what happened and letting you make your own mind up. Whilst at first this was quite an experience, by the end of the second day, the cemeteries had all started to look the same. I went home rather disappointed. My Mother rang me at work the day after I got back asked me what I thought of the trip, I told her that I was disappointed, and probably would have found it more rewarding if I had had someone to visit. It was then that my mother told me "My Mum had someone". I asked a few questions and my mother told me that all she knew was the name "Falla", which she'd read off a large coin-like object as a child. All her mother's secrets had been locked in a drawer upstairs. She'd seen this coin once, but Auntie had emptied the drawer when her mother had died (my aunt was considerably older than my mother). 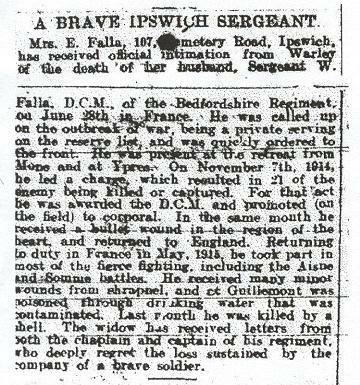 Son of William and Emma Falla, late of Wood House St., Ipswich; husband of Ethel Falla, of 107, Cemetery Rd., Ipswich. The address matched that of my Grandmothers house up till 1932 when she moved. We'd definitely found our man. I'd never met my Grandmother. She'd died before I was born. Up until now, I thought she had only been married once, this explained the difference between my Mother's and Aunt's accounts of their fathers. The other piece of information from the Commonwealth War graves site that struck me was the reference to DCM. I didn't know what a DCM was so I searched the internet. Eventually I found that the Distinguished Conduct Medal, was second only to a VC (a medal I had heard of!). Something else also clicked into place, having seen a picture of a DCM I now knew what the medal was that my Aunt had been so protective of when I was a child. My Aunt had died in 1978, so I couldn't ask her about her father, so I set about investigating William Falla. I knew my Aunt was born about 1913, so I started by trying to find a Marriage certificate for my Grandmother sometime about that period. At the local records I obtained a copy of her Marriage Certificate. It was actually dated March 22nd 1914. It also had the information that William Thomas Falla was a Foundry worker. My next stop was to try and get his Military record, for this I enlisted the help of a researcher recommended by Taff Gillingham. I gave the details to Taff and after a few weeks was told that the records did not exist, but that he had found the Medal Index and Citation for the DCM in the London Gazette. When Taff gave me copies of the information, he said the Citation was like something out of "Boys Own." From the Medal Index, it became apparent that William Falla must have been part of the BEF, showing him as arriving on the 23rd August 1914. My next move was to contact the Bedfordshire Regimental Museum. They were unable to help, but suggested I contact the Public Records Office, Bedfordshire and ask for Nigel Lutt. This I did and after an initially disappointing response, Nigel became very helpful. He agreed to conduct a search for me and offered to contact someone who could tell me when William Falla initially enlisted by looking at Silver service badges (an Award I believe is given to someone invalided out of the forces). A couple of days later, he sent me copies from the war diary and Official diary for November 1914, when Private Falla won his DCM and June 1917 when he died. Additionally, from the Silver service records we could be reasonably sure that William Falla joined the Bedfordshire regiment as a regular in October 1904 probably serving 7 years which was a standard term at the time. This meant that he probably came back to Ipswich in 1911. In the next two years he must have started work in the foundry and met my Grandmother. I still wanted to know more about William Falla, and so I decided to search the local paper. I thought that his death would be easier to find, rather than when he had gone to war or won his medal, simply because I felt that any entry in the paper would be in the next two or three weeks after his death, whereas when he won his medal it had to be Gazetted. Would my grandmother know before or after the Gazette etc. Whilst I had as much information as I thought I was likely to get, I still didn't know what he looked like (The East Anglian did not carry pictures at this time). I tried Nigel Lutt at the Bedford Public Records Office again, but he was unable to help. Orwell Works was the Site of Ransomes Simms and Jefferies a large local engineering company. I'd had a feeling that he worked here from his wedding certificate because this was the nearest company which would have had a boiler shop. I traced his records at Ransomes, and found that he could only have served about 3 years in the Army, as it showed him joining Ransomes on 13th February 1908 as an engineering labourer earning 17 shillings a week. 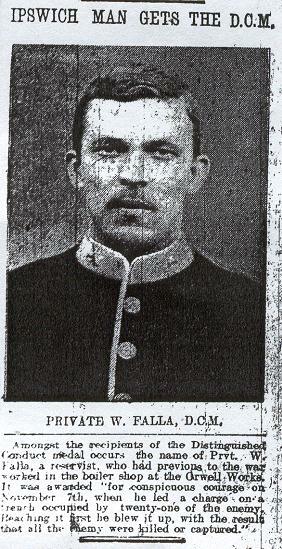 It also showed him as being called up on the 26th August 1914. As I said earlier, his Medal Index cards shows him as arriving in France on 23rd August, and from this I conclude that he was owed some Holiday money. That completes the story for now, I still have a few more leads I want to research. I don't know what happened to the DCM, I haven't seen it since my aunt died, I think I also saw his War medal which my mother had in her jewellery box, minus suspender. We were burgled a short while later and I think they were probably taken then, and as none of us knew what they were we didn't really miss them. I've never seen his other medals or his "Death Penny". If anyone out there knows about any of them I'd love to hear from you.